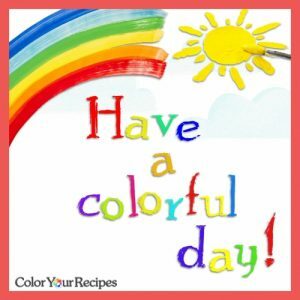 Hi, I am Juliana, the person behind Color Your Recipes. My blog is a collection of mainly simple recipes, although once in a while I indulge myself with special and more elaborated ones. Because of my diverse background, which I will tell you a bit later, I am extremely open to mix and match ingredients used from the far east to the most west kitchen. I was born in Taiwan, raised in Brazil and now based in Los Angeles. I acquired a PharmD. degree specializing in Biochemistry and I currently hold a faculty position at the local university. My professional interest is in prevention of cardiovascular disease and the mechanisms behind it…okay, enough of that, you are not here to read about my paid profession. Due to my unusual background I grew up eating Taiwanese and Brazilian food, which is compiled from a variety of European influence. I love creating and recreate, that might explain my passion for research. Kitchen setting is not much different from a biochemistry/chemistry laboratory, they all have the objective to study the changes of structure, composition and properties of a substance. Cooking is a kind of science…by subjecting your food to various reactions such as baking, braising, steaming, grilling and other methods and finally by analyzing the changes of the initial structure, which can be access by your taste buds. The answer is very simple…like a coloring book, you are free and welcome to make your mix and matches…I just want to inspire and present you with a template (recipe) and from this template you can “color” it the way your palate desire. The changes can be big or small, it is all up to you, let your creativity out. Do not worry if you are not inspired to make any change…all the recipes here are tested, so go ahead and try it yourself. Please feel free to contact me at coloryourrecipes[@]gmail.com or on the form below, I will be more than happy to get back to you. In the meantime, enjoy this site as much as I enjoy sharing the recipes with you.